Since 2001, Téada has exploded onto the international touring circuit, capturing the imagination of many with a creative and spontaneous musical approach, seeking to capture the intricacies of Irish traditional art form within a contemporary band context. With two highly regarded album releases, Téada were quickly tipped by Irish World newspaper as “one of the most exciting traditional groups to emerge in recent years”. Voted “Best Traditional Newcomers” by readers of Irish Music Magazine in 2003, subsequent frequent headline performances at major music festivals throughout the US, Canada, Europe and Australia has seen the young lions of Irish music evolve into one of the most successful Irish touring acts worldwide with an established reputation for a knock-out live show. Most of the group’s members grew up in rural Ireland, learning traditional music through local classes and by listening to older musicians. “It was really a very organic process,” says Mac Diarmada. “With Téada, we wanted to capture some of that rawness and individuality of the solo artist within the dynamic of a full band.” Oisín, on fiddle, was joined in the band initially by John Blake on guitar and later flute, Seán McElwain from Monaghan on banjo and bouzouki, and Dubliner Tristan Rosenstock on bodhrán. 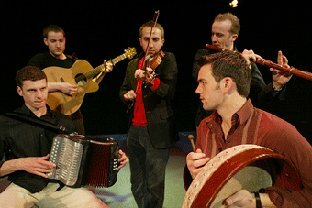 Following a growing popularity, particularly in the US, which had seen the band becoming a full-time worldwide touring act by early 2003, the band sound was augmented greatly by the joining of Co. Laois accordion-player Paul Finn. The end of 2004 saw founding member John Blake depart the band for other pursuits as Sligo flutist Damien Stenson became the most recent addition to the line-up. Téada’s fresh take on tradition continues to sound a chord. Their most recent CD “Give Us A Penny And Let Us Be Gone” on the Green Linnet label (GLCD1228) has garnered high praise. Irish Music Magazine calls it “one of the most deeply satisfying works to come our way in a long time.” “A priceless collection” adds the Irish Voice, and Sing Out says it’s “a smashing second release from the young lions of Irish music!” The future looks bright for this young band, whose fierce familiarity with the old ways makes for inventive music for a new generation.